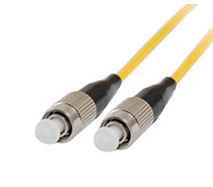 SelenOptics has developed both fiber tapers for mid-infrared fibers and connectorized fiber jumper cables. The taper technology has been demonstrated and integrated in customer applications and this know-how can be customized upon customer requests. Fiber jumper cables with different lengths are terminated with standard FC/PC connectors. Other types of connectors are also available. These cables find their applications in the pigtailing of mid-infrared products (laser, modulators, switches, etc) and in the transmission of laser power to remote location with minimal optical degradation.